Friday November 9th 1883 We were busy about the work all the forenoon, I went to town to order groceries and was at Hatts a little while. Mary went to society in the evening I was busy doing some house-work and knitting before Mother came at ten oclock. 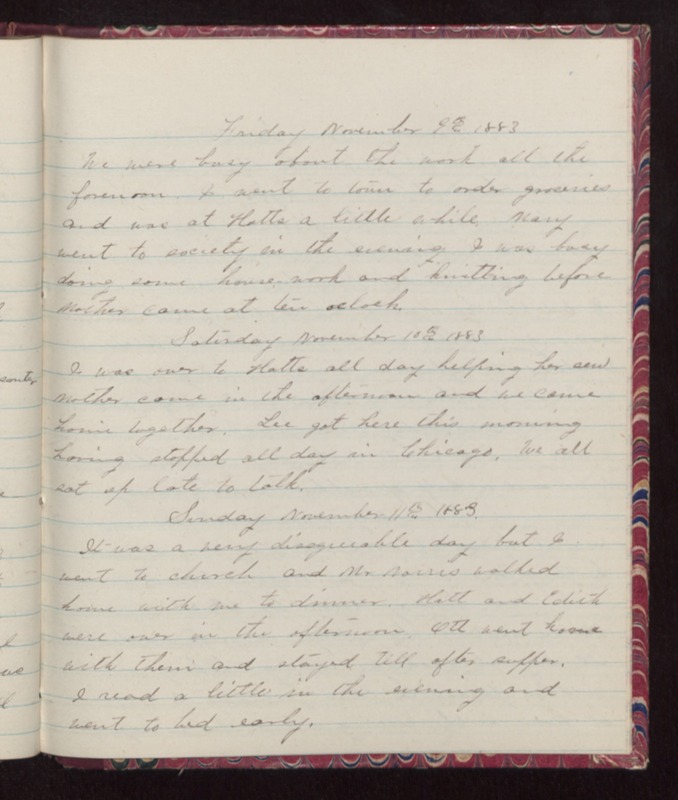 Saturday November 10th 1883 I was over to Hatts all day helping her sew Mother came in the afternoon and we came home together. Lee got here this morning having stopped all day in Chicago. We all sat up late to talk. Sunday November 11th 1883. It was a very disagreeable day but I went to church and Mr Norris walked home with me to dinner. Hatt and Edith were over in the afternoon. Ott went home with them and stayed till after supper. I read a little in the evening and went to bed early.